Lindsey was born in Chicago, Illinois. She attended private catholic grammar schools and then public high school. She worked in her fathers tool and dye business during her teenage years and got interested in cooking from her grandmother. Shortly after graduation, she got married and had two children, one a girl and one a boy. While raising the children, she attended Northeastern University in Chicago and graduated with a B.A. degree in art. During this time she was managing an upscale health food store. She also enjoyed traveling with her family. Lindsey moved to the Washington, D.C. area after her children were grown. Her son, who is a video graphic artist, made a visit to D.C. one time and suggested she try public television. She immediately liked it . While working on one of the cooking shows at Channel 10, she decided to do her own show, being a producer and a host with guest chefs. She has been doing the show for more than 30 years with more than 1000 episodes. She also has done more than 180 episodes of a similar baking show. Because of her connections with the publishing companies, she is able to get cookbook authors from around the country to appear on both shows "Recipes from the Chefs Kitchen" and "Easy Baking with Lindsey". She has won many awards at Channel 10, for both shows...including an award for the longest produced show at the station. She is now married to a retired meteorologist (who was also from Chicago). He currently directs her cooking shows and maintains the website. Lindsey enjoys reading, music, traveling and playing poker. 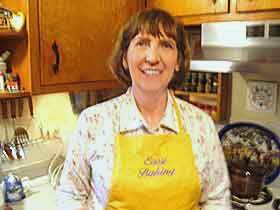 During her travels she has collected recipes that are now on her website. She has become a great grandmother and enjoys cooking at home for her family.